In our house, my girls (aka The Princesses) must say this no less then 10 times a day easily, especially in the evenings and weekends, when they are home from school. The Princesses Loving Each Other – Love to Read, too! Plus, Emma is excitedly learning how to read now in Kindergarten and Lily isn’t far behind. To this end, I am often back at the library, shopping on Amazon and even Scholastic Book orders through school. So, when I get the chance to get advance copies of new kid’s books for my girls, I am honestly thankful for these types of opportunities. Because who would complain at free books? Seriously to me it is like Christmas everyday whether the books are for them or me, as well. Recently, I was asked if my girls and I would like to read and post a short review of an entertaining, new children’s book. You better believe the mom to two avid readers jumped at this opportunity. Then again, they do take after both Kevin and I, who absolutely love to read, as well so this so doesn’t shock me. Well, you may be asking what book we got to read and enjoy? This House Needs A Mouse, written by C. Jeffrey Nunnally. This is a beautifully illustrated children’s book with a difference. 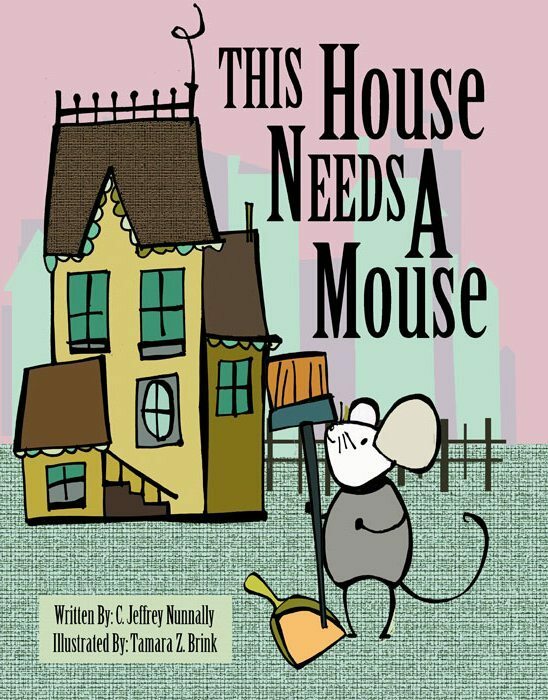 See, This House Needs A Mouse is a fun tale of a mouse who seeks a life outside of his caged existence, and through a series of events, finds himself free and experiencing life with all its ups and downs. An engaging read-along for your child, but also so much more! The Book reading level is aimed at 3 to 8 year olds. A teaching tool (the teacher in me 100% approves) for budding readers and writers being educational and delightful. To that end is filled with mentor text such as alliteration, vivid verbs and purposeful repetition to name a few. What did The Princess Think About This House Needs A Mouse? They gave it two fancy thumbs up, asking if we could get a mouse for all the crumbs they leave behind. I told them they have Elsa (their puppy) for that now and apparently our house needed a dog not a mouse! Want Your Own Copy of This House Needs A Mouse? So, with the holidays just round the corner, this book is also a great gift choice, too! The book is now available on Amazon, Barnes and Noble, Big Tent Books, as well as, the author’s website. On a side note, I will be at a BlogHer Sponsored event today in NYC. I will finally get to meet one of my closest and dearest blogging friends, Kathy from My Dishwasher’s Possessed. So very excited, but will be a bit off the grid, during the day. And last but not least, in case you missed my Holiday Gift Guide from last week which includes #Holiday #Coupon Deals, please check it out HERE!! I’m so glad your girls enjoyed the book! Sounds like a book my nephews and niece would like! I can’t wait to hear about the BlogHer event…that is so exciting. I need to plan another blog trip…even if it’s a mini one. I’m feeling ansy. 🙂 Hope you had fun! I’m reviewing the book as well but haven’t had the boys read it yet. I can’t wait to see what their reaction is but I’m pretty sure they’re going to want a mouse afterward!! Enjoy the city today! Nothing beats NY at Christmas:) My girls – especially my oldest – loved books as well. We gobbled them up, and I was happy to sit and read to them. And my oldest is pretty much the biggest reader I’ve known as an adult now, so I guess it “stuck.” That book looks adorable. I think books are a wonderful Christmas present. It;s so awesome when the kids WANT to read and enjoy it, isn’t it? What a cute book! I hope my girls never get too old for picture books. I still love them! This seems like a great book. It must be if your princess’ want a mouse. I am so excited that you are going to a blogger conference, but I do wish it was me that you were meeting. I cannot wait until one day I get to give you a big hug for all your support. I love that your girls love reading. What a wonderful gift you have given them, Janine. Well done, Mom, and Happy Friday to you. Glad they enjoyed the book! I haven’t read the whole thing yet ;). This will be perfect for Bee! I need some new books for her and I’m about to order some from Amazon. Hope you have had a great day at the BlogHer event!!! Sounds like a great book for your girls. My boys have always been big readers – I miss the days of sitting and reading together. Books are wonderful! I’m so, so happy that Lily has entered this wonderful world of reading, and reading she does. About everything that she encounters. And books are on her holiday wishlist, which makes me happy as well 🙂 Enjoy this fun book with the princesses! Have fun in NYC! Getting books does feel like getting a fun present, I agree. 🙂 This book looks really, cute, Janine…and so is that picture of your girls! This sounds like the cutest book ever!!!! I will totally be checking this out for my nephews!!! Thanks!! I will be reviewing it on Monday and my whole post revolves around Scarlet’s reaction to it. It was awesome! Such a lovely story! It’s always “Can we read another one?”, here too! Oh I hope you had fun at the event! And I know it’s too late, but I wish I could have hugged Kathy through you!! I love children’s books too! We have soooooo many books it’s crazy! I accumulated quite the library as an Early Childhood Professional. Then when I had kids of my own, the addiction multiplied tenfold! As a homeschooling mom, I run my own Scholastic Book Club – I’m always buying books from them (and they have such an awesome reward program too). This sounds like such a sweet book. This sounds like a delightful book and I’m always on the hunt for new books. Madison’s library is ever expanding but she just loves to read just like your princesses. I hope you had a great time at your Blogher event. Can’t wait to read about it. Here’s to a wonderful weekend. How wonderful that they are all about the books, Janine! I loved reading as a girl so you brought back great memories for me 🙂 Your overview of the book is well done too! This sounds like such a cute and original book. I’ll keep it in mind for when Annalisa’s a bit older. You are doing such a wonderful thing getting your girls passionate about reading at such a young age. Sounds like a very cute book! Thanks for sharing. That’s so funny that they wanted a mouse after! Ahaha LOL. Such a cute story of a mouse. Definitely need to get some books for Reiko too. will have to look into that book…so cute. I love the illustrations of this book! And my son just read it for the second time today! This looks so cute. 🙂 Emma & Lily are reading up a storm.